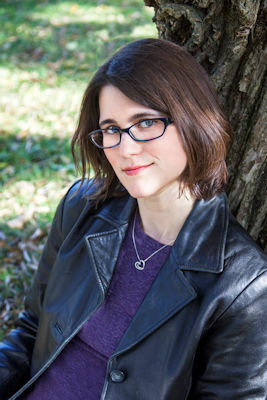 Please welcome Tracy Townsend to The Qwillery as part of the of the 2017 Debut Author Challenge Interviews. The Nine is published on November 14th by Pyr. Please join The Qwillery in wishing Tracy a very Happy Publication Day! Tracy: Thanks for having me! I started writing when I was very young -- second or third grade -- and my earliest projects were all comics, mostly featuring talking animals in Sunday morning funnies-type situations. I read broadly, everything from Beverly Cleary to Ian Fleming’s James Bond novels. By the time I was in middle school, I’d graduated into creating what folks today would call fan fic, though I don’t know that I knew the term or if it was really widely in use in the early 90s. My first major project was a James Bond fan fic novella written entirely in longhand in a spiral notebook that was supposed to have been for history notes. I wrote because I admired certain storytellers and I wanted to understand how they created these remarkable things I admired so much. I’d gone to writing workshops and been in writing clubs, but all but the best of those experiences felt like the blind leading the blind. The only way to figure out how the magic was done was to crawl up inside the stories and reverse engineer them myself, in my own way. I kept in the habit throughout high school, writing episodic series on demand for friends with really specific tastes, and writing short stories featuring characters my friends and I played in tabletop RPGs. I loved writing to my friends’ prompts best of all; it was this perfect gift for them I could create, something we shared together. It wasn’t until I went to college that I realized I really wanted to write professionally. Prior to meeting some really formative peers and instructors there, it had always just been something I was good at, but felt like a bit of an impostor actually doing. Tracy: Oh, I’m definitely a hybrid -- just one trouser leg on at any given time. I tend to start with a very vivid concept or character, and I start building up scenes and situations to explore it. I keep myself moving by jumping from each clearly visualized moment to the next. After I’ve built a good head of steam doing that, I step back to review what I’ve created and figure out what pulls it all together. What are the events I’m focused on, and how are plot beats coming into being? Do I have things in the right order? What’s the throughline? It’s during that pause, answering those questions, that I plot out the gaps in my narrative, and only then do I resume writing. The fact that I love writing in close third from multiple characters’ points of view means this kind of hop-around drafting process works when I’m getting a project off the ground. The downside is that knitting all the pieces together can be intensely surgical -- and sometimes leads to dead ends, scenes that end up on the proverbial cutting room floor. I admire writers with fast, efficient plotting and drafting processes, but I’ve never been able to create a project that interests me if I have to imagine the whole narrative from a cold start. Tracy: I work full time as a teacher at a public boarding school for gifted students. I know a lot of other writers who are also teachers and parents, too, of course, but the particular kind of school where I teach involves a level of hands-on stewardship of the students -- involvement in their clubs, their social events, their lives in the early and late hours of the work day -- that’s pretty atypical. Everyone struggles to achieve work-life balance. But in a lot of senses, my work is my life, and I tend to wear myself down serving both masters. I can’t stand disappointing people, so if something’s going to get short shrift when time and energy are at a premium, it will almost always be me. Tracy: I grew up reading comics (X-Men, Elfquest, Wolverine, Bone) and playing tabletop board games, so my whole youth revolved around variations on the “mismatched people bound by circumstance save the world” theme. I love that trope and there’s always some piece of it in anything I write. I love it because it’s much less about the “save the world” stuff and really more about a given story’s take on “found family.” I grew up far away from my nearest relatives, aside from my parents and brother, and so the “family” I turned to most often was the family of friends I collected, through school and writing and general geekdom. The way people who love each other because they chose each other bond, and how those bonds push and pull at them just as fiercely as blood-bonds, fascinates me because it’s so much a part of my lived experience. My husband teases me all the time about plot just being my excuse to get people in a room being emotional at each other. Really, he’s not wrong. TQ: Describe The Nine in 140 characters or less. TQ: Tell us something about The Nine that is not found in the book description. 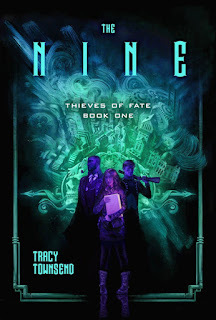 Tracy: I wrote The Nine to be a fantasy work that mashes up a lot of my favorite things -- political machinations, conspiracies, heists, found family, “mandatory unretirement,” steam- and clockpunk stylings, redemption arcs, interspecies conflict, gray morality. That’s far more than back cover copy alone could address, sure. But the thing I’m proudest of was Publishers Weekly’s review of The Nine’s “nearly flawless writing.” I about fell out of my chair in shock -- and relief that the effort had been recognized! I wanted to give my readers a feeling of prose-level care and craft that no back cover copy can effectively promise. I wanted to make a beautiful monster. It’s up to everyone else to decide if I succeeded. TQ: What inspired you to write The Nine? What appeals to you about writing Fantasy? Tracy: The idea for The Nine actually comes from Talmudic legend: the lamed wufniks, which Jorge Luis Borges writes about briefly in his Book of Imaginary Beings. Reading Borges piqued my interest and got me reading the Talmud and Kabbalah for details that eventually became important to the idea of the fate of mankind resting on the shoulders of a kind of “sample” population. It’s only through a genre like fantasy that I could take my next thought -- that this seemed like a very strange cosmological variation on a scientific experiment -- and turn that into the premise of a novel. I love the slipperiness of fantasy, how it bends everyday logic and supplants it with its own sets of rules of conditions. It can be heroic, cautionary, escapist, political, pessimistic, or hopeful. I knew The Nine needed to be fantasy because I needed to bend and break a lot of rules and fuse together a lot of different visual and narrative styles to pull it off. But really, much more than it being the right tool for this particular story, it was the one I wanted most to explore and push into the shape I desired. They say you should write the book you wish was already out there for you to read. The Nine is the book I needed and wanted but never quite found. TQ: What sort of research did you do for The Nine? Tracy: Oh, God, so much research. I researched autopsies and human anatomy. I researched Gothic architecture. I researched early photographic technologies, and deadly toxins, and period hats and footwear, guns and ammo, rappelling gear, and particle physics. And all of that was before my first round of revisions. 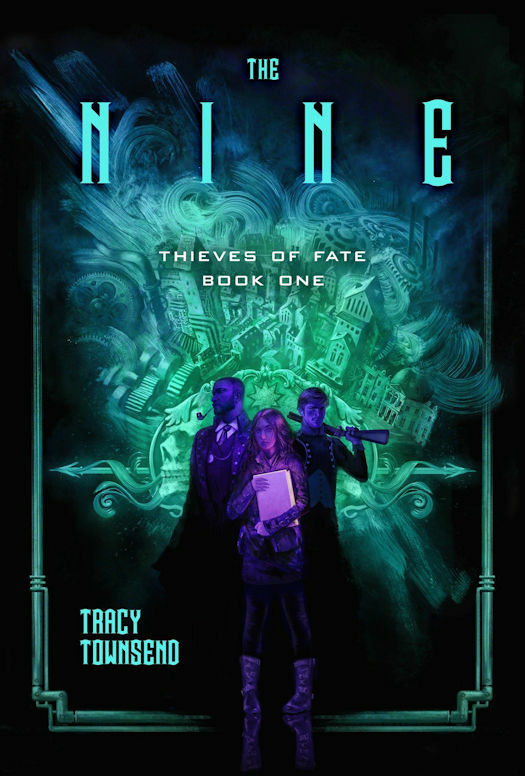 TQ: Please tell us about the cover for The Nine. Tracy: Adam Doyle (whose amazing portfolio of work you can find here) was my cover artist, and I couldn’t be happier. I hope he does the art for the rest of the series. He’s done covers for Chuck Wendig and Maggie Stiefvater (which was great for my six degrees of publishing separation ego, let me tell you) and illustrations for Fantasy Flight Games. That last credit was hugely exciting for my friends and me, because we’ve played many of the games he’s contributed to. Adam starts with sketches and ultimately creates paintings which are later rendered into the cover images. That’s what gives The Nine’s cover that murky, swirling depth. If you look closely, there are a lot of smaller images buried in the background of the city behind the pictured characters -- gears and pipes and skulls, great atmospheric notes. Adam read the book in manuscript form and asked me for some additional information about the named character from it so he could refine his vision of individual figures. I’ve never asked him if he had a specific moment from the book in mind for the cover, but honestly, that’s because I feel I already know the answer, down to chapter and page. This “Avengers, assemble!” moment featuring Rowena, the Alchemist, and Anselm really helps focus the sprawling narrative around the characters whose actions will do the most to shape its outcome. TQ: In The Nine who was the easiest character to write and why? The hardest and why? Tracy: Often, my easiest character to write is Anselm. He’s easy because his way of seeing other people is so entirely alien to me. He’s a cynical, manipulative, self-assured egoist, smart and acid-tongued -- the sort of person you want on your side because it’s too dangerous having him against you. Writing characters less like me is easier than the ones more like me, because I think of it as deep character acting. (I worked in theater quite a bit years ago, and though I’m an indifferent actor, I’m a very good line coach, and in a lot of ways, that’s what writing a close POV really is -- line coaching yourself as author.) When the character itself chafes me, I’m more conscious of the need to stay in character, and that keeps me focused. Haadiyaa Gammon, on the other hand, is very hard for me to write most days. I understand her completely, and even relate to the pressures she feels. That makes me work harder to ensure I’m examining her choices thoughtfully. She’s done things she regrets, but did them because she didn’t trust anyone else to do the right thing in her place. Gammon isn’t afraid of the sacrifices it takes to serve the pragmatic good or of being the bad guy for the right cause. I’ve been there, in my own way. TQ: Why have you chosen to include or not chosen to include social issues in The Nine? Tracy: I don’t even think twice about “including social issues” in my writing because if I’m doing my job right, they’re already there. Part of the reason genre fiction is so powerful is that it defamiliarizes the conditions of our world, or extrapolates them through thought experiment, or supplants them with foreign elements, all with the hope of giving us insight into human nature. Authors and readers stare down a funhouse mirror of reality through so-called “escapist” fiction. Genre has always done this, to varying degrees. It’s just begun to do it more overtly in recent years, which is what makes it seem to some readers as if “social issues” are suddenly everywhere. They always were there. Now, authors are simply doing more to highlight them in their narratives. As for this book, the world of The Nine is full of the problems caused by plutocracy, imperialism, xenophobia, and exceptionalist ideas of power and influence. Sometimes, these issues are present the way air in a room is. Other times, they’re spoken of directly. Since the crux of the plot is about mankind’s survival -- whether it can prove itself worthy of its place in existence -- I have to hold humanity accountable for what it’s done. That’s where the anxiety about our fate really lies. Are we worth it? Do we deserve this world? Is it too late to make good on the ills we’ve done, as individuals or as a people? TQ: Which question about The Nine do you wish someone would ask? Ask it and answer it! Tracy: You know, nobody asks about character names, and I wish they would. There’s a specific story behind almost every one. I agonize over names. They do a lot to form a character, and often to Easter egg in details about who or what they really are. Probably the best name story of all is Rare’s. Rare is an important secondary character in The Nine, and part of the web of happenstance and conspiracy that pulls the three main characters (Rowena, Anselm, and the Alchemist) together. I was listening to an excellent BBC radio drama production of Stanislaw Lem’s Solaris at the time I was first drafting The Nine. There was a character whose name I kept hearing as “Rare.” (Important to remember here that the actors all had quite perfect English accents, and so the rhotic pronunciation was strongly in evidence throughout the recording.) I thought it was simply marvelous that this character -- a love interest central to the main character’s emotional trauma -- had such a lovely, unusual name. I also knew the character I was writing at the time was going to be at the center of a lot of bad emotional history for the main characters in The Nine. It was perfect, so like a good little magpie, I stole the name. Much later, long after the first draft was complete, I was in a used bookshop and saw a copy of Solaris on the shelf. I grabbed it and started leafing through, only to discover that the character in question’s name was actually Rhea. The actors’ rhotic “r” following the “a” had totally thrown me. But by then, I was too attached to Rare being Rare to possibly rename her. TQ: Give us one or two of your favorite non-spoilery quotes from The Nine. Tracy: It’s time for The Nine’s sequel! It has a working title and hopefully it doesn’t change along the way, but I’ll be keeping it secret for at least awhile longer. You can expect to hear more about the series and what’s in store for its characters soon. For now, suffice it to say the drama surrounding the missing book, the Ecclesiastical Commission, and the aigamuxa and lanyani species is far from resolved. Pursuing its loose ends will take the characters outside of Corma, the city setting for the first book, and into the rest of the world the so-called Grand Unity shaped. Tracy: Thank you! I’d love to hear from your readers. Talk to me via email at tracy at tracytownsend dot net or on Twitter (@TheStorymatic).